Advanced, NIT and EAMCET along with IPE) and also IIT Foundation classes from 8th standard to 10th standard classes in English Medium on contract basis under School of Excellence and Colleges of Excellence all over Andhra Pradesh. There are total 37 vacancies of JL, PGT teachers available in this current recruitment of AP Gurukulam. Eligible and interested candidates can send their applications through mail before 30-06-2016 b 05:00 PM. 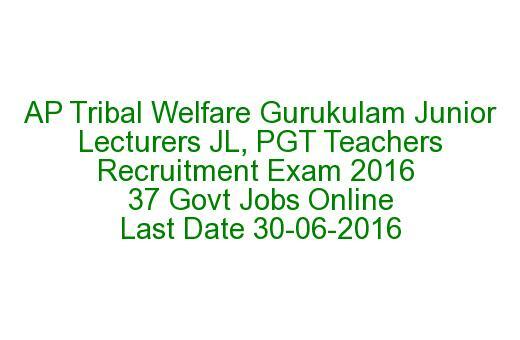 For more information see the below given details regarding AP Gurukulam JL/PGT recruitment 2016. 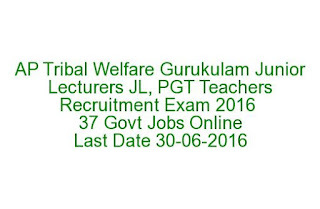 There are total 37 vacancies available in this JL/PGT Recruitment of AP Gurukulam. No specific age limits are given for this AP Gurukulam Recruitment. Degree with good academic record and B.Ed with 2 year of teaching experience. The candidates must have the capacity to teach in English. Those who are studied Degree in English medium will be preferred. Based on previous experience, performance in interview and Demo it is negotiable. Right candidates will get the right payment. Selection procedure will be held based on written test which is conducted for 75 marks and personal interview & Demo conducted for 25 marks. Those who are qualified written test they will be informed by phone regarding interview dates and Demo. For attending test/interview the candidates has to bring the printout of application form with the attestation on photograph. See the official notification of AP Gurukulam JL/PGT Recruitment 2016.